Active Trans’ Bike Walk Every Town program is training suburban advocates to lead campaigns to create better communities for walking and biking. One of the topics we focus on in our trainings is how to build support and mobilize community members around advocacy campaigns. Organizing fun and engaging community events is a fantastic way to build awareness for a campaign or project you’d like to see supported by your elected officials. Events like these can offer an opportunity to connect to residents and encourage them to become more active in advocating for better biking and walking. So what type of events can help get your neighbors engaged in your local advocacy? Have you ever been to a bike rodeo? A bike rodeo is an obstacle course designed to help kids learn bike safety skills. They are becoming increasingly popular events held throughout our region and are a terrific way to expose kids to the many benefits of biking. 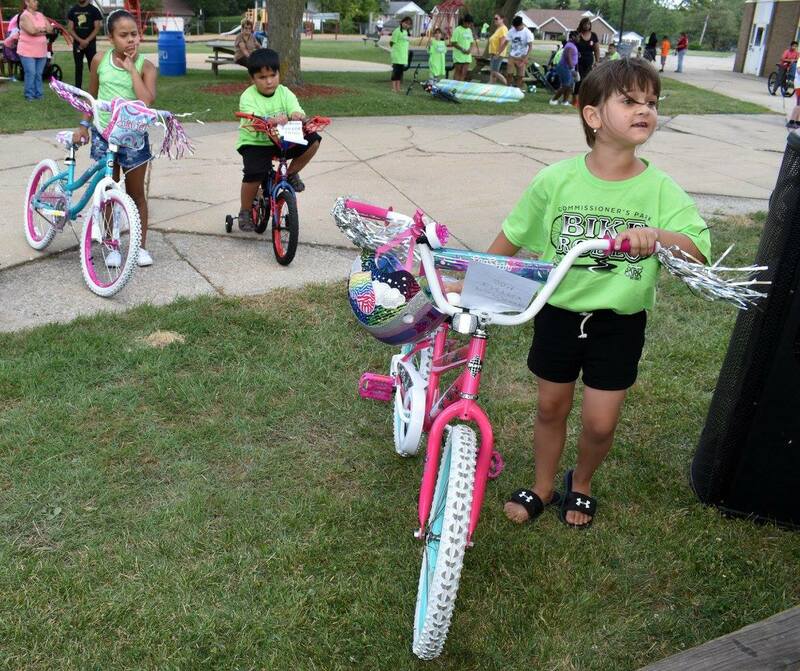 To get some insights into what’s involved in planning a bike rodeo, we spoke to south suburban resident and Chicago Heights Park Commissioner Jessica Mancina about her rodeo organizing experience. Mancina, a Bike Walk Every Town participant, has been organizing bike rodeos for the City of Chicago Heights since 2009, but the event has actually been going on for much longer. The Chicago Heights Police Department started the event more than 30 years ago. Last year, the rodeo attracted more than 200 children and their families. 1) Create an overall plan: What do you want to accomplish? Who should be involved? Mancina suggests involving others who are passionate about the event, creating a timeline and assigning tasks to your team. 2) Find a location: You will need a large, flat space such as a park, a parking lot or tennis court where you can set up different stations to test maneuvering skills such as stop/starting, turning, balancing, etc. 3) Plan out your stations: Get creative and think about what you want kids to learn. A helmet fitting and decoration station can teach kids how to make sure their helmet is fitted correctly. A figure-eight course can help test balance and steering control while changing directions. Asking kids to “stop on a dime” can test brake control and setting up a “slow race” can help bicyclists hone their low speed balance skills. The number of stations you include in your rodeo will depend on the amount of space you have and the number of volunteers you have to lead the stations. 4) Find volunteers: Each station needs at least one adult (although two is preferable) to provide instructions. In Chicago Heights the police department manages the obstacle course. 5) Find sponsors: Finding community partners that can provide healthy snacks or rodeo course materials like traffic cones and chalk can be a big help. Having free bike helmet (or bicycle) giveaways can also help draw in the crowds. Check with your local police department, hospital, forest preserve or Rotary Club to see how they can help. In Chicago Heights, Mancina’s goals are to see every child own a bike and to activate their passion for biking, and she has gone to great lengths to achieve this. She includes interactive games at the rodeo such as hula hoop contests, a water balloon toss and digital scavenger hunts. Past events have included a petting zoo as well as pony and camel rides. Kids earn raffle tickets throughout their experience at the rodeo that they can use to win a new bicycle, bicycle accessories or other outdoor toys such as jump ropes, frisbees and basketballs. You can learn more about the Chicago Heights Bike Rodeo on their Facebook Page or email the organizers at bikerodeo60411@gmail.com. Event organizing is one of many ways to build more public support for walking and biking in your community or neighborhood. Visit our Bike Walk Every Town advocacy page for resources or reach out to Maggie Melin at maggie@activetrans.org or 312-216-0475 for information on how to get started advocating for better walking and biking in your village or city. Photo courtesy of Jessica Mancina, Chicago Heights Park District.